December came along with its usual holiday hope, but little in the way of cold weather or a snow white Christmas. Heck, most of the month felt like springtime. I’d personally rather be too warm than too cold. My bionic parts do not like frigid temperatures. And yes I picked up a new bionic right hip (to match my other hip and neck) the first week of December. Ice and snow do not work well with walkers or canes so I certainly appreciated the balmy conditions. 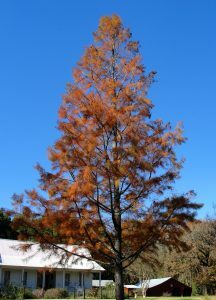 Mild winters show off some of the South’s most famous plants and tend to make gardeners from the North jealous. So far it has been a grand season for camellias (Camellia japonica), sasanquas (Camellia sasanqua), sweet olive (Osmanthus fragrans), early narcissus (Narcissus tazetta), and other mild mannered plants that inspired legendary Southern garden writer Elizabeth Lawrence to pen Gardens in Winter (1961, Claitor’s Publishing). 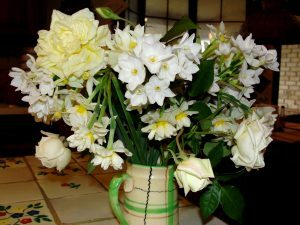 I even took a bouquet of paperwhites (Narcissus tazetta papyraceus), Narcissus x italicus, and double Chinese sacred lilies (Narcissus tazetta orientalis ‘Constantinople’) to my sister-in-law on Christmas Eve. Paperwhites often suffer freeze damage here but once in a blue moon we experience a genuine paperwhite Christmas. And it’s rare for Miss Italicus to bloom in December and even more rare for me to have anything but blasted buds and frozen foliage on Chinese sacred lilies this far north. They are all powerfully fragrant so I hope she didn’t toss them after I left. Some folks, like me, love their loud obnoxious fragrance while others run at the site or smell of them. 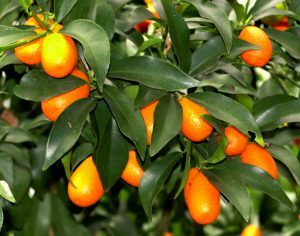 A mild winter in the South is also a godsend for popular but marginally cold hardy citrus like dainty kumquats (Citrus japonica), seedy Changsha tangerines (Citrus reticulata ‘Changsha’), yummy Satsuma mandarins (Citrus unshiu), and beautiful Meyer lemons (Citrus x meyeri). Thankfully Dr. Bill Welch and Dr. Scott Beasley (by way of friend Bill Jobe) both shared a few Meyer lemons with me. This purported mandarin-lemon cross is better tasting, juicier, and a bit more cold-hardy than typical grocery store lemons. Dr. Beasley, the retired Dean of Forestry at Stephen F. Austin State University has two trees in his backyard in Nacogdoches that he protects with a makeshift greenhouse each year and produces as many as a thousand large, tasty lemons! Friend Linda Crum also shared her homemade Meyer lemon marmalade with me. Thank you all! 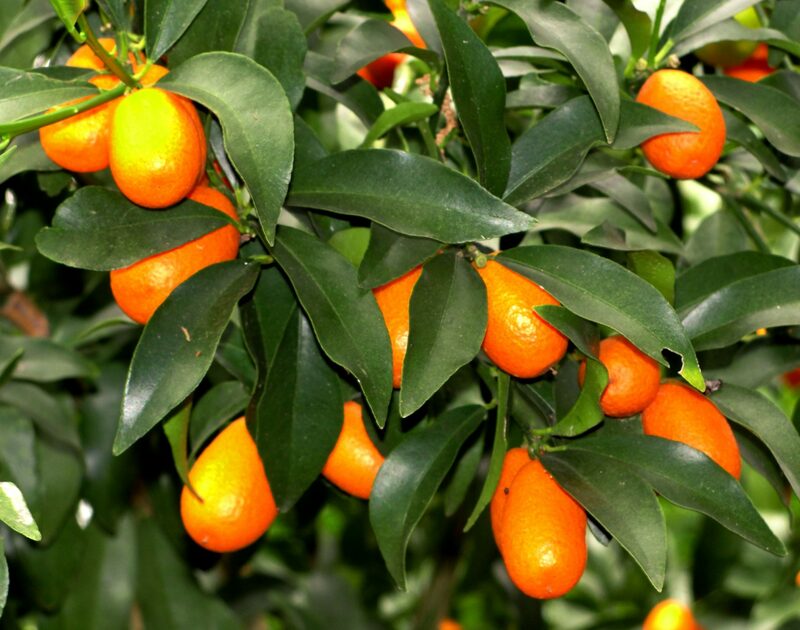 I sure miss my little backyard full of citrus when I lived in San Antonio. Speaking of lemons, I learned a valuable lesson in the age old struggle between the old and faithful vs. the shiny and new. 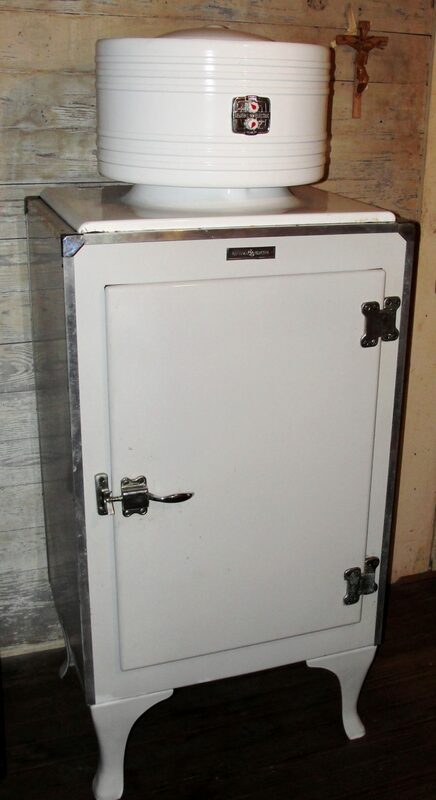 Last year I decided to replace my vintage 1953 GE monitor top ice box that the late Pam Puryear gave me with a brand new Big Chill retro refrigerator that I thought would be both functional and aesthetically pleasing in my old dogtrot house. So I drove three hours to a specialty shop in Houston and as expected paid twice what a normal Whirlpool refrigerator should cost to have it shipped to me from out of state with its new retro shell. I do love to cook and freeze fresh produce from my year-round garden so I assumed it would be a match made in heaven. Unfortunately it was hell instead! The first sign of trouble came with its arrival when it just barely fit into my tiny kitchen. My dad and Uncle Noel were kind enough to carefully and strategically move it into place for me, but after ripping my vinyl floor with the hard to move behemoth both emphatically declared that they would never offer their services again and that I’d better hope the new appliance lasted the rest of my life! That stupid statement sounded so simple and naively hopeful at the time. 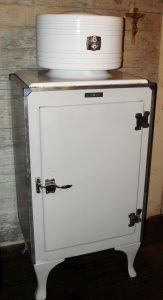 Pam’s old ice box lasted two generations in her family and is still going strong up at Big Momma’s house. Sadly before a year was up my Big Chill started to freeze things in the refrigerator compartment and then completely thaw in the freezer portion. I contacted the place I bought it and was put in contact with the company that made it. They in turn sent a repairman out who put some coolant in it. It worked for a bit then did the same thing again. Then the repairman came and put a new part on it. But the lemon went right back to its old ways and I tossed out more thawed or frozen foods. I tried to explain that to discard homegrown produce is a sacrilege to a professional horticulturist who grows his own food, but to no avail. The nightmare continued when I came back to my house after surgery to once again find my freezer compartment thawed and the refrigerator portion barely cool. Mr. Repairman showed up again and put more coolant in it and the refrigerator portion promptly froze solid and then rewarded me with several big pools of water on the floor. You can only imagine the verbiage coming from my mouth as I’m trying to move a big refrigerator and get my crippled carcass down to clean up the mess before the floor was completely ruined. I’ve never been so mad in my life. I spent Thanksgiving, a return from surgery, and Christmas with no fresh or frozen food. In my book that’s cruel and unusual punishment. There’s a special place in hell for anybody responsible for me throwing away hand shelled peas that I developed and that don’t exist any other place in the world. I miss my old GE monitor top! She still has the original coolant in her from well over half a century ago. Lesson learned. Stick to the old tried and true and shop local. Shopping local reminds me that our family never purchased a Christmas tree, ever. Early in life my father would cut a native red cedar, then I started selecting assorted wild and artistic specimens before succumbing to familial ridicule and growing my own carefully coiffed horticultural selections. But since my parents and the grandchildren have grown older my mom announced several years ago that she didn’t want me to plant anymore Christmas trees. 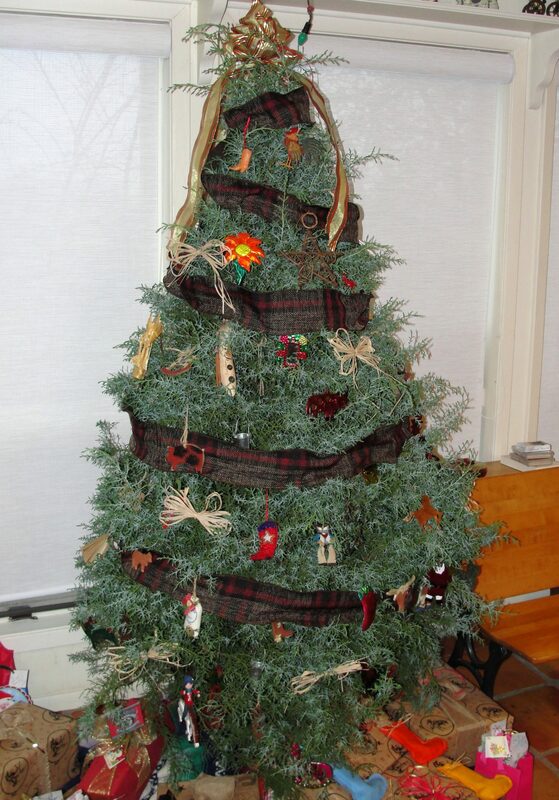 After my grumbling Grinch father cut the last one she would no longer put up a large tree, only a diminutive one sporting her little homemade decorations. 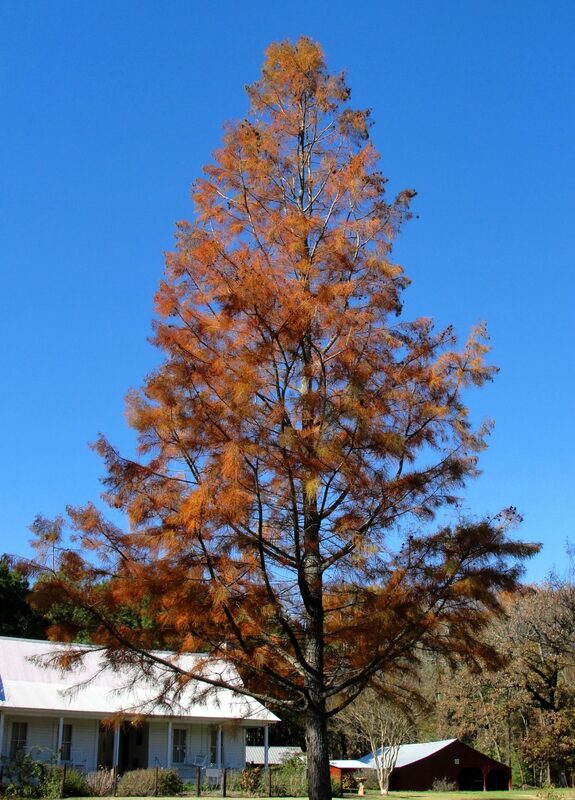 This was the final year and from my prostrate hip-couched position I watched my seedling cypress from Mexico get hauled to the house, cursed, and finally decorated. It got the last laugh however when it promptly fell over the next day to the shrieks and horrors of my mother. PS: On a sad note, Neil Sperry’s Gardens magazine recently shut down after a wonderful 30 years. The print business is tough these days. I hate it because I do love to write. Neil is a dear friend and I was a regular contributor for many of those years. Unfortunately I lost my best paying writing job! He continues all his other successful endeavors and I wish him all the best. He’ll always be my hero. Thankfully I’m still writing for Texas Gardener magazine each issue. It’s available in both digital and print formats. My current article is on friend Thera Lou Adam’s daffodil “field of dreams” in central Louisiana. I’d like to replace my lost writing job with a syndicated newspaper column on life in Arcadia…sort of a Leon Hale type. If newspapers still exist that is!